Thyme has a distinct aroma and has lent its piquant flavor to many a fine dish, but, for an Ellenville couple, the fragrant herb was the impetus for an entire restaurant whose keystones are fresh, local, healthy. 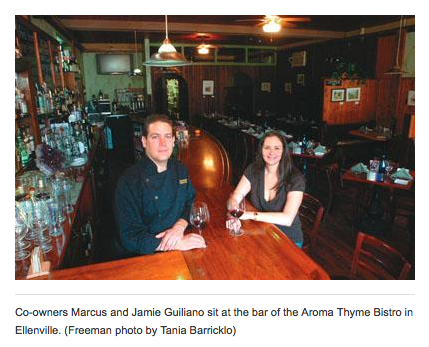 Marcus and Jamie Guiliano opened their Ellenville restaurant, Aroma Thyme Bistro, on New Year’s Eve 2003 with a purpose to which they have been faithful, even messianic: As chef, he, deliberately and consciously, has mastered the skills necessary to turn natural, whole food into something beautiful to behold and delicious to eat. Then, he said, Jamie became pregnant. “I revamped my way of living, not just for myself, but because I was now responsible for someone else,” he said, adding that he made massive changes — to organic, wholesome food — and has never looked back. “About four years ago, the discovery of holistic cuisine changed my life,” he said, adding that the challenge then became how to meld gourmet, five-star cuisine, for which he already was renowned, with the holistic ingredients he was discovering. Aroma Thyme, ultimately, came about because of that dramatic decision and because he realized that he just could not cook for anybody else anymore. 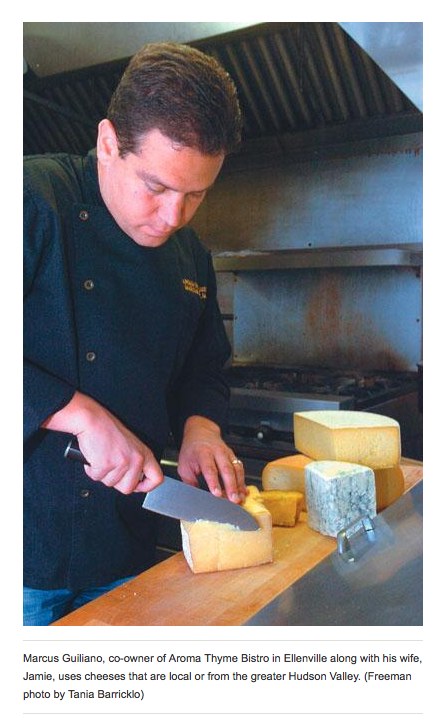 “My health-based, ‘green’ cuisine style had evolved so much that I either had to work for Alice Waters (a California-based chef prominent in the organic food movement) — or do it myself,” he said, adding that they came to Ellenville so he could be his own boss. Their return to Ellenville, from the West Coast, was actually a homecoming, Jamie said. “I grew up here, and Marcus came when he was 9,” she said. “We met in high school and we’re high school sweethearts,” she said. Ulster County Comptroller Elliott Auerbach, at the time village manager and Marcus’ running partner, said Ellenville needed young people like them to bring the tiny village back to better times. “I looked at this building three or four times before we decided to buy it,” he said. Aroma Thyme has earned the coveted Green Dining Association’s certification as a “green” restaurant, one of only two privately owned eateries in the mid-Hudson Valley to be so designated. Bell’s Café and Bistro in Catskill is the other. Describing the food he conceives and serves as “eco-lectic,” Marcus said his goal is to offer an innovative menu of focused, natural quality that reflects the ideology of balance and well-bring. He added that he he has never wavered from his continuing objective of creating meals from products that are fresh and pure and need no manipulation to achieve exceptional taste. “I am anti-white sugar,” he explained with an unapologetic grin. He said he achieves his culinary end by avoiding butter, heavy dairy products and white flour products that mask food’s natural goodness. The couple’s biggest challenge is also its greatest asset, he added. Marcus also said many carnivores have told him they only eat meat at Aroma Thyme, because they know it’s is sourced locally from Hudson Valley Cattle Co. in Stone Ridge. “Claude Osterhoudt’s cattle never leave the ranch, never receive antibiotics or vaccinations. The herd is healthy and *grass-fed and he slaughters only two per week,” he said. *correction: Oserhoudt's beef is not grassfed, it raised on grass pasture and fed supplemental grain. Sorry for any confusion. We promote truth in menu and do not want to mislead anyone. Marcus said he likes to take advantage of what’s fresh, so he keeps the menu flexible. In addition, he likes to introduce new products or ingredients that he’s found or that have found him. “I find the ingredient first, then figure out how to present it on the menu in a recipe,” he said. The veggies, of course, come from local farms and some herbs from a small chef’s garden in back. Naturally, thyme plays a starring role. “We’ve known them since they were young, and it makes us proud to see how they’ve grown up,” he said, adding that Burns has set up a beer review web site, www.foaminghead.com, for beer aficionados. The couple said they believe a significant part of their mission is educating their customers. There is a blog at www.marcusguiliano.com and a website, www.aromathymebistro.com, as well as monthly beer and wine tastings. He also presents videos at marcusg.tv in which he uses his name, but not the restaurant’s, because the purpose is information and education, not promotion. They are considering opening another restaurant in the future that won’t be a replica of Aroma Thyme, but will share the same principles of fresh and local, Marcus said. He added that’s he’s also working on a book. For now, however, the forefront of everything is education.